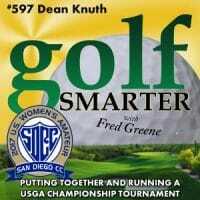 597: Dean Knuth, creator of the Rating/Slope system for handicapping golfers (he’s known as the ‘Pope of Slope’), and founder of Knuth Golf returns to talk about the 2017 US Women’s Amateur Championship which takes place at the San Diego Country Club August 7-13, 2017. Dean is Chairman of the organizing committee and knows that you’d be amazed and what’s involved in logistics and budgets to run a USGA sanctioned event. This conversation is accompanied by a complete PowerPoint slide set that can be seen when you watch this episode at YouTube.com/GolfSmarterTV (link specific). If you’re also a fan of baseball, especially baseball history and how it relates to today’s game, please check out RADIO BASEBALL CARDS https://www.smarterpodcasts.com/category/radio-baseball-cards/, the newest podcast from SmarterPodcasts.com.